Got chubby cheeks? You can still get cheekbones to die for with some contouring magic! These days, Makeup 101 skills just won’t cut it anymore. It’s time to step up your primping game by learning how to use strategic shading techniques. Maybelline’s chief makeup artist, Archie Tolentino, shows us how you can use contouring to bring out your best face shape and highlight your gorgeous features. “The goal of contouring is to create the ideal facial shape,” says Tolentino. First, focus on the areas that you want to slim down or recede. If you look at the photo, that’ll be along your hairline, your temples, the sides of your nose, the hollows of your cheeks, and just below your lower lip. “Contouring mimics the natural shadows that fall on your face, so the placement should be in those areas,” explains Tolentino. Everyone’s face shape is different, so you can also opt to shade more areas such as your jawline if it’s more pronounced. 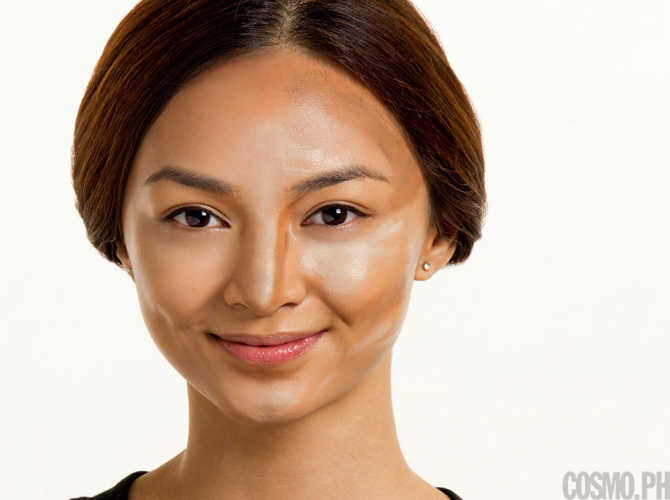 What most women don’t realize is that highlighting is just as crucial when it comes to contouring. “Aside from making the high planes of your face more pronounced, it also ‘pushes’ contours deeper into the skin,” says Tolentino. “This emphasizes the sculpted effect that you want to achieve.” When highlighting, stick to the places where the sun would naturally hit your face: the center of your forehead, bridge of your nose, underneath the eye area, top of your cheekbones, above your jawline, and the center of your chin. And don’t forget to blend well, Cosmo girls! 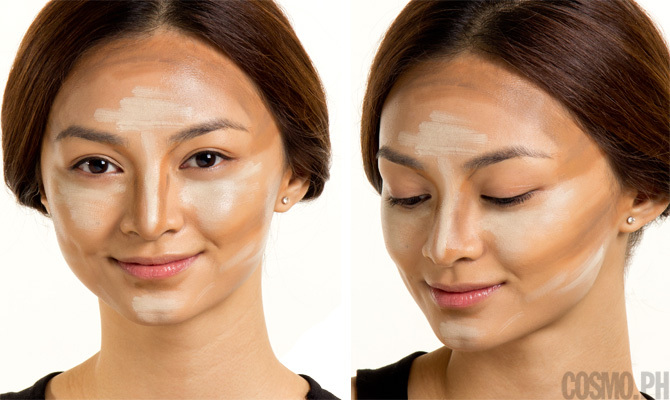 Cosmo Tip: The real trick to contouring perfectly is to use circular strokes to buff and blend the colors well with your foundation. “Practice with powder-based products first since they’re less intense,” suggests Tolentino. Try the Make Up For Ever Sculpting Kit, P2,400, (available at Mega Fashion Hall). Want more drama? Then go for a cream foundation with buildable coverage like the Bobbi Brown Foundation Stick, P2,350, (available at Rustan's Grand Mall Makati).